Here is a cute Valentine's Day bulletin board idea I found on the internet a few years ago. I have done this for the past several years and get a lot of compliments from the other teachers and staff. I haven't added a title yet, but I usually put up "First Grade Love Bugs." Here is a close-up picture of a love bug. I make a butterfly out of white poster board for each student. I also cut up a supply of tissue paper into small squares. I use Valentine colors, like red, pink, and purple. I divide my students up into groups of 2 or 3 and give each group a cup of watered-down Elmer's glue and a supply of tissue paper squares. 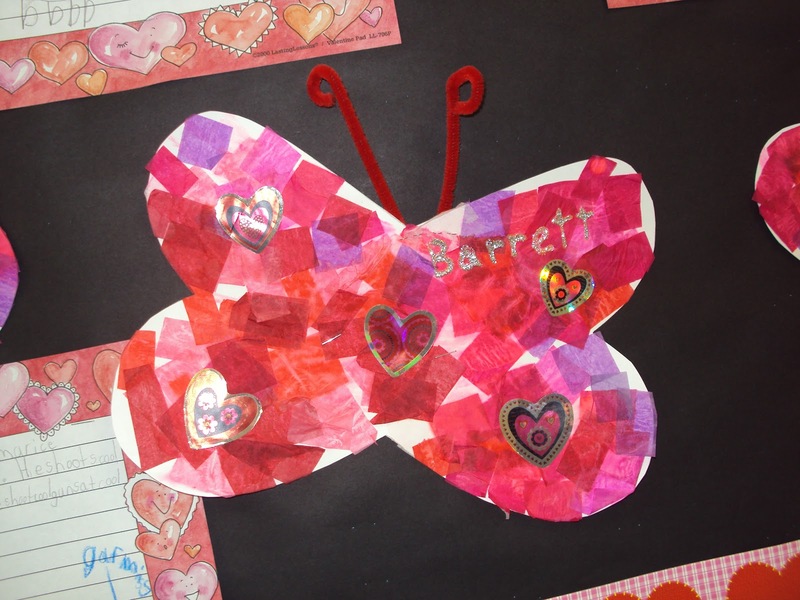 Students paint a section of the butterfly with the glue-water mixture and start placing the squares of tissue paper onto the glue. I tell the kids to overlap the pieces and use the different colors to make a pretty effect. After covering each section, I have them take the paintbrush and gently go over the tissue paper until they are all flat. 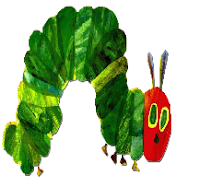 Students repeat this with each section until the whole butterfly is covered. 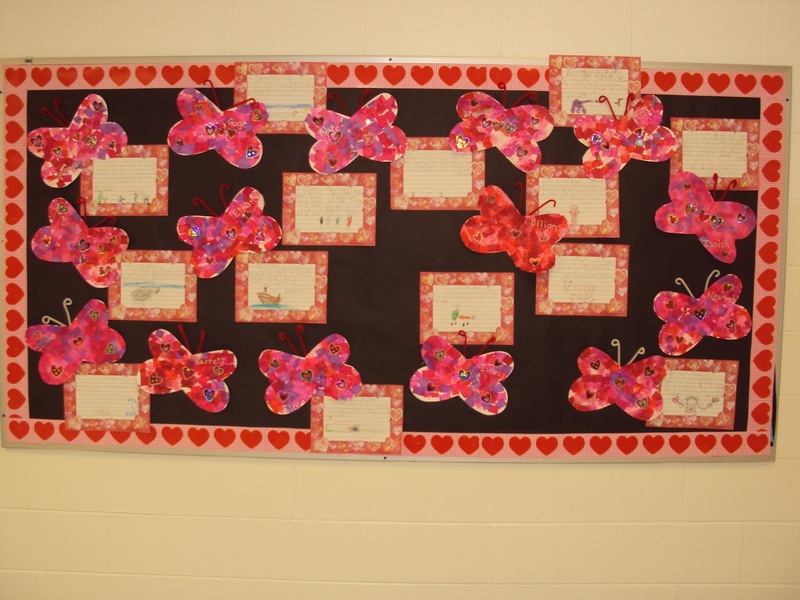 After the bugs are dry, usually the next day, I give students a supply of heart-shaped stickers to decorate their love bugs. Then I take silver glitter glue and paint each child's name on their love bug. After this is dry I add pipe cleaner antennae and they are ready to display. 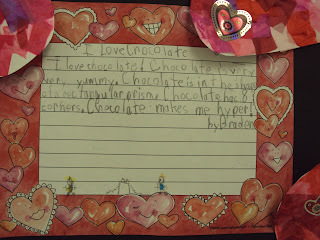 I also had some really cute Valentine's Day themed stationary, so I had my first graders complete a writing activity about something or someone they love. I had a lot of students write about their pets, toys, cartoons, but I just had to share this little guy's-he wrote about chocolate! I love chocolate! Chocolate is very, very yummy. Chocolate is in the shape of a rectangular prism. Chocolate has 8 corners. Chocolate makes me feel very hyper!